Near the end of Castles in the Sky (2014), the docudrama about the invention of Radar broadcast on BBC Two earlier this month, Robert Watson-Watt (Eddie Izzard) shows his colleagues a television set.1 This produces another of the little scientific breakthroughs that form the core of this quietly endearing piece. The set is at once modern and archaic: in the programme’s 1930s setting this gleaming new object is a technological marvel, proposing a solution to a challenge on which the defence of the nation rests, but in the visual rhetoric of the 2014 drama it appears almost comic. This reminded me of some of the tensions that sometimes result when television technology appears in docudramas, either in terms of sets or studios. This article runs through a few such moments in pieces including The Fools on the Hill (1986), The Road to Coronation Street (2010) and An Adventure in Space and Time (2013). Castles in the Sky ends with a brief depiction of the Battle of Britain whose outcome is partly attributed to Watson-Watt’s team’s achievements, but the programme’s emphasis is on the incremental steps made by the team in their attempts to innovate despite working with insufficient resources and class-coded institutional scepticism. This makes it sound like it’s somewhere between an Ealing comedy – though not The Man in the White Suit – and The Sound Barrier,2 and Watson-Watt’s introduction of the television set works along those lines. Its small proportions are emphasised by its proximity to Watson-Watt behind it and by its position in a medium long shot on the contemporary audience’s widescreen televisions. The shot means that the old television set temporarily occupies the space in which our own televisions sit, but the widescreen frame has to fill the space not occupied by that narrow set – and the extra information that we get is, tellingly, empty space surrounding the fictional television set. But to draw comedy from one set’s anachronistic presence in another would be as mistaken as contrasting character eccentricities and studied trivia with issues of national importance (a mistake made by some of Watson-Watt’s superiors and the odd reviewer). This television set’s small workings are a key advance and Watson-Watt’s discovery was cued by his hearing radio coverage of the exciting new development of the world’s first “high definition” television service. Notions of “high definition” have changed too, of course, but the principle remains that television and Radar are parallel modern wonders. So many of the specific challenges faced by Watson-Watt’s team resemble those faced by BBC staff in the build-up to the start of their Television Service in 1936, such as the need to address range, that it is almost inevitable that television should feature here. Indeed, Castles in the Sky reminded me of The Fools on the Hill (1986), Jack Rosenthal’s drama about the birth of television.3 Here, too, a set of committed experts slowly advance toward a goal that the characters, like the modern audience, understand to be historically significant despite scepticism within their own institution. Like Watson-Watt, the television pioneers achieve their goal despite resourcing problems (the battle between the Marconi-EMI and Baird systems), a need to impress visiting top brass and a need to meet shrinking targets: here, the Radiolympia trade demonstration in August 1936 provides a challenging deadline to add to an already-improbable service launch date of November. The “triumph over adversity” frame is a difficult one to achieve when the main opposition is either impersonal (the wrong sort of valves) or institutional (despite their concerns, and even with the espionage tactics deployed in Castles in the Sky, the institutions initiate and support the work). Often in campaigning docudramas, the micro-stories of individual struggles serve as “a metonymic device” through which wider social issues or macro-stories can be debated (for instance, a girl’s illness and the politics of nuclear power).4 Castles in the Sky was made with the involvement of the Open University and both pieces mentioned so far help to document and personalise technological and cultural inventions – but the two teams’ obstacles and triumphs raise broader questions. Therefore, what is at stake in Castles in the Sky and The Fools on the Hill is a shared understanding of the impact of technological and cultural developments on society, as these pieces not only document moments in history and progress but form a history of progress and the contested nature of the term. The Fools on the Hill, too, has fun with teething troubles and subsequently outmoded practices, but complaints about anachronism are anticipated and headed-off with a sense of the long game, as early television viewers (and we) are told that a pivotal broadcast “will doubtless be thought primitive a few years hence”. Successful examples of communication – in particular sending and receiving signals – are therefore central to these pieces’ moments of triumph. Watching television making history becomes making history by watching television. The “triumph over adversity” frame is therefore presented in part as a triumph over social and cultural elitism, even class snobbery. 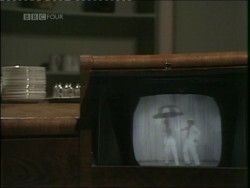 In The Fools on the Hill, staff watch a television set in the canteen – enjoying communal pride in the progress of their work as much as the product itself – not long after Director General Sir John Reith has stormed out of the studio in disgust at the populist entertainment on offer. In Castles in the Sky, Watson-Watt marks his difference from the Establishment by loosening and removing his tie, and he and his team will remain outsiders. The Fools on the Hill seems to open with an equivalent moment, but one that is gendered: Wendy Piggot-Smythe is summoned to Broadcasting House after being seen in public without stockings – an offence against BBC “standards” – and is ordered to move from Radio to join those “footling about” at the new Television Service at Alexandra Palace. Piggot-Smythe sees this move as “exile”. But if our sympathies initially lie with her against seemingly reactionary forces, those sympathies are complicated: following her involvement in the romance plot that provides the skeleton for the play’s witty retelling of key moments in the birth of television, Piggot-Smythe’s lack of commitment to television is linked with her personal qualities and class position. As all three strands come together, her home’s television reception is deliberately sabotaged, and the ease with which the reception is disrupted (a strategically-revved motorbike) is less important than the judgemental response of Piggot-Smythe and her father, which ends Pygott-Smythe’s involvement both professionally and personally: she will instead return to Radio and work alongside “more my sort of person”. In The Fools on the Hill it seems anachronistic to be not television. More groups of outsiders pioneering television, despite the attitudes of the institutions in which they work, feature in the excellent recent docudramas An Adventure in Space and Time5 and The Road to Coronation Street6. Indeed, both pieces stress the creators’ outsider status as part of making a case for the programmes’ own. In An Adventure in Space and Time, young female producer Verity Lambert, Canadian ex-ITV populist (and reorganiser of BBC drama) executive Sydney Newman and young gay Anglo-Indian director Waris Hussein are central to the creation of Doctor Who; in The Road to Coronation Street young gay Northern writer Tony Warren creates Coronation Street at a time when Granada executives Sidney and Cecil Bernstein are engaging with questions of quality alongside Granada’s regional franchise requirement to reflect the North West of England. Television’s creative environments become sites of cultural memory in complex ways that are as much about television’s present and future as they are about the past. In An Adventure in Space and Time, compositions and camerawork stress the centrality of Television Centre to the creative work made within (and facilitated by) it. 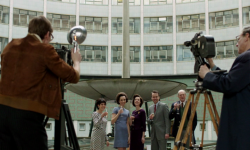 Television Centre is “reflected” as Newman enjoys the idea of Doctor Who – the association with movie-style moguls is just the start of its complex attitude to television – and the door to reception features strongly in a tracking shot as Newman briefs Lambert. 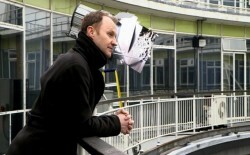 Television Centre features strongly in the programme’s depiction of casting press calls for Doctor Who. The first image above becomes our touchstone for the happiness of lead actor William Hartnell (David Bradley), while the second image comes from a montage of constant cast changes while Hartnell is becoming ill, confused and worried that new production teams don’t understand or value his show. Replacing the more varied and prosaic nature of Doctor Who‘s casting announcements, the docudrama’s repetition of Television Centre and the statue of Eros provides a neat shorthand for emotional and institutional developments. As in The Fools on the Hill, it is at the moment of reception that characters in An Adventure in Space and Time and The Road to Coronation Street realise that their efforts will work. In keeping with the Hills argument above, Doctor Who‘s success is emphasised through paratexts: Doctor Who is successful when newspapers depict Charles de Gaulle as “the Degaullek”, when the Daleks are impersonated by children,11 and when the cast see a toy dress-up Dalek. Coronation Street‘s potential is signalled when a tea lady sits down engrossed by the soap Granada don’t seem to want – producer Harry Elton (another Canadian) marvels as she recognises, and interacts with, its world. Female address and social realism were central to early studies of Coronation Street and the soap delivers on the hopes expressed by Warren here, in particular when he shows the director the cobbled street and community he wants to reflect and reach. Her presence, and that of others including those responsible for casting, helps to make visible the hidden – as Faye Woods has observed, hidden and often gendered – media work that takes place in television’s offices and spaces outwith the studio. The Road to Coronation Street was written by Daran Little, that splendid writer of EastEnders and Coronation Street, and archivist of the latter. Little’s status, and the fact that The Road to Coronation Street went out during Coronation Street‘s own 50th anniversary year, raises strong parallels with Gatiss and An Adventure in Space and Time. However, there is one crucial difference: although The Road to Coronation Street was made by Granada, it was made for the BBC. 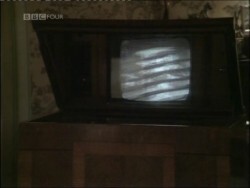 This fact is particularly striking when we see moments from Florizel Street (the soap’s working title) on a monitor: at such times the Granada attribution in the diegesis competes with the digital on-screen graphic for the docudrama’s channel, BBC Four. This marks another moment that, for all its historical reconstruction, is also about the present: The Road to Coronation Street‘s place in the lineage of the BBC Four biopic-about-television rather than soap, the role of indies in BBC commissioning, the programme’s place on a minority digital channel (whose own existence as the BBC’s “place to think” has much to say about shifting public service discourses) away from primetime ITV and the move to network centralisation where once companies like Granada had a powerful regional remit. When Coronation Street first goes to air, at the end of The Road to Coronation Street, the executives watch along with the community they serve. One last way in which both these docudramas raise the relationship between past and present is in their form. Both programmes celebrate the invention of television programmes, but face the challenge of depicting television practices that the industry has moved away from. 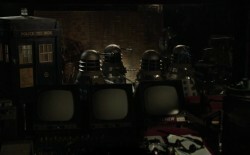 The idea that studio drama may be a site of specifically televisual discourses12 is not explored in An Adventure in Space and Time, which dwells on the difficulties of shooting in such conditions, although it does celebrate creativity – those “abuses of the television studio” that Ian Potter noted, techniques which produced signature Doctor Who elements like the opening titles and certain special effects.13 There is no doubt that both docudramas show the studio as a place of wonder, for instance when Warren marvels at the creation of the Tanner house and Hartnell forms a connection with the TARDIS interior. (In a later piece I will write about such reconstructions of television programmes and sets, as well as the use of archive footage: after all, the combination of the fictional real and the real fiction sets up an indexical relationship specific to docudrama. Such docudramas are doubly reconstructed in that they are “made” by characters who are themselves depicted in historical reconstructions of television spaces.) But what do these docudramas make of television? Doctor Who often shot exteriors (as well as particularly tricky interiors) on film, and this clapperboard starts a sequence re-enacting the filming of a famous moment from The Dalek Invasion of Earth: the Daleks invading future London. But is An Adventure in Space and Time, as a 2013 drama, happier with filmic discourse? It often makes Doctor Who’s multi-camera video recording feel like filmed practice in ways that the makers know were not the case but which were intended as a shorthand for contemporary viewers who, it was felt, would be more familiar with film practice. Examples of this calculated shorthand include a bell ringing to mark the end of shooting scenes, and the production using standing sets, instead of the reality: rehearsals in a church hall with tape on the floor to indicate where sets will be, and sets built to shoot an entire episode in one session. (Coronation Street would transmit one episode live and record the next as-for-live.) But standing sets allow An Adventure in Space and Time to play vital behind-the-scenes moments against Doctor Who backdrops. When Newman gives Hussein and Lambert a chance to re-record the “pilot”, they walk to the Totter’s Lane gates that are entered at the start of Doctor Who’s first episode – as if their adventure is also beginning. Later, Hartnell bids farewell to Lambert on the TARDIS set, a blurring of production and fiction departures that is built upon in a later near-breakdown sequence and which shows the value of docudrama approaches. Using cinema practice as a shorthand is potentially problematic given current academic debates on aesthetics and specificity: medium specificity and specificity of our methodology. These include the need to question the current misuse of the term “cinematic” as a value judgement predicated upon removing television drama from the context of television.14 There has clearly been massive industrial and stylistic convergence between television and film over the last few decades, with the enthusiastic support of many (if not all) programme makers. However, the misuse of the term “cinematic” in popular and academic writing has seen relevant ideas subsumed by some television academics into a wilful ahistoricism that neglects a long history of filmed and non-filmed television drama and thereby risks narrowing our sense of the range of forms that contemporary drama can take, risks disavowing the televisual, risks simplifying “cinema” and, paradoxically, risks underselling the best of today’s television by limiting the criteria through which we define quality. An Adventure in Space and Time and The Road to Coronation Street are clearly not ahistorical, they clearly argue for the importance of two genres that critical discourse has been known to marginalise (soaps and “science fiction”) and they clearly celebrate (indeed, cherish) televisual achievements – but what about the nature of the programmes’ own engagement and dialogue? Where does this scene stand on this? Film is a controllable commodity, subject to mediation that was not applied to the original performance. Cinema is implicated with reactionary forces: while The Scarlet Pimpernel burns we are told that the film industry is “frightened” of television. The alien quality of film is underlined by the presence of the film camera in a play about television and in a shot that has been videotaped. But the play has itself been recorded, and made with more sophistication than the live broadcasts that the play portrays. The burning also reminds us of institutional and cultural perceptions of television as ephemeral, which would later result in the wiping of many programmes that were recorded and which leaves us without a record of television before the 1950s. Burning the film recording returns The Scarlet Pimpernel to a one-off, ephemeral performance lost forever – in short, to television as depicted elsewhere in the play and as criticised in World Film News: “the evanescent impressions of direct broadcast” which make it “difficult to build a body of criticism.”19 Characters are disgusted by this reduction of The Scarlet Pimpernel to ephemerality: so much for liveness as medium specificity. Meanwhile, when this play went out in 1986, British television drama had already produced decades of filmed dramas, and the BBC itself was shifting its drama strategy to a greater emphasis on film (Screen One rather than Play for Today). Therefore, this drama about an all-but obsolete form of drama20 was itself, as a videotaped, partly studio-recorded, single drama, a form whose days would turn out to be numbered. An Adventure in Space and Time closes after a tracking shot across the television studio gallery, the now-empty creative environment, and an impossible, museum-like standing-set collection of Doctor Who icons – the TARDIS, the Daleks. The extract that we end on is from The Dalek Invasion of Earth, a scene we saw reconstructed by David Bradley earlier, telling us that “One day, I shall come back”. 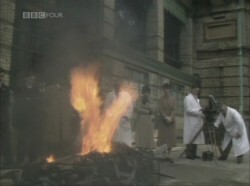 He’s right, he will come back – Hartnell will return in person and in the archive replaying of this very scene to mark, respectively, the programme’s 10th and 20th anniversaries.26 But it also reminds us of the 1990s, when the BBC wasn’t making Doctor Who and although it existed it was not in television but in books, audios and comics. Unlike in The Road to Coronation Street, captions do not fill in what happened next: there is no caption to tell us that Doctor Who is now a hit and that the BBC can’t be daft enough to cancel it again – it’s in the form. (The role of captions in docudramas like these is a topic for another day.) We are in a television studio but the style marks that practice as “other”. Matt Hills, drawing from Ann Gray and Erin Bell’s work on TV and history, argued that An Adventure in Space and Time “employed high production values in its HD recreation” of 1960s Doctor Who in order to signify “quality, authority and legitimacy”, shaping a “historical gaze”.27 The docudrama enjoys the creative environment of the studio, and we end in that magical space between production, institution and reception. But is there a danger that, in docudramas like these, the form itself disavows the television space through historicising it? This article has left lots of ground uncovered in its discussion of docudramas about television: for example, what about their integration of archive footage, or their mediating use of captions, or their reconstruction of specific scenes from television programmes? And how am I getting away with giving the blanket label “docudrama” to pieces that have been described variously as “fact-based dramas” and “biopics”? (Wouldn’t it be problematic if I treated all biopics as a sub-section of docudrama? I’ve been light on theory and “docudrama studies” here, but this might not always be the case.) Questions like these, and much more analysis of these programmes and other contemporary docudramas may well be next, as this article is meant to be the first in a series on the many different types of British television docudramas, their ideas and their practices. ‘Adventures in Studio Space: British television’s creative environments’, Università Cattolica del Sacro Cuore, Milan, NECS 2014 Conference: Creative Energies/Creative industries (June 2014). ‘Gesture politics and control freak actors: New Labour as performance in The Deal and The Queen’, University of Reading, Acting with Facts: Performing the Real in British Theatre and Television since 1990 (May 2009). Originally posted: 30 September 2014. 7 October 2014: added quotations from Barr, Greene, Drazin, Jacobs and Rosenthal. 5 February 2017: amended start of title from ‘Notes on docudrama’.